Guest artist Dennis Dotson will join the Stephen F. Austin State University Swingin' Axes and Swingin' Aces jazz bands in concert at 7:30 p.m. Friday, April 20, in W.M. Turner Auditorium. NACOGDOCHES, Texas - A concert by the Swingin' Axes and Swingin' Aces jazz bands at Stephen F. Austin State University will feature tunes by jazz greats Chuck Mangione, Pat Metheny and Maynard Ferguson, along with works by guest artist Dennis Dotson, when the student ensembles perform at 7:30 p.m. Friday, April 20, in W.M. Turner Auditorium. Highlighting the Axes' program are Dotson's "Close to Home" and "Civic Duty," according to Dr. Deb Scott, director of the Swingin' Axes. Dotson, a trumpet player, will perform these tunes and others with the Axes. "Dennis grew up in East Texas and is well-respected all over the world for his jazz playing," Scott said. "His mother recently passed away, but she came to many of the Axes' and Aces' concerts over the years." A professional trumpeter for more than 50 years, Dotson began his career playing in Houston while attending Sam Houston State University. He has played in house bands in Las Vegas and was a freelance musician in New York City and Houston. He has performed with Woody Herman and Buddy Rich bands as well as the bands of Carl Fontana, Bobby Shew, Tom Harrell and Kenny Wheeler. 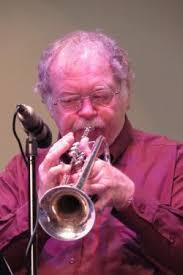 He is jazz trumpet instructor at The University of Texas at Austin and was formerly on the faculty at Houston Community College and the University of Houston. Dotson will also perform with the Axes Metheny's "Always and Forever," Mangione's "Legend of the One-Eyed Sailor" and "Give it One" by Maynard Ferguson and Alan Downey. "The Axes will perform 'Attack of the Killer Tomatoes,' which is a piece we will record this semester for the Sound Recording Technology's School of Music CD," Scott said. "It's a really fun arrangement." John DeBello's tune is arranged by Gordon Goodwin. A performance of "My Way" by J. Rebaux and C. Francois, with lyrics by Paul Anka and arrangement by Eric Burger, will feature Barry Martin on vocals. The Axes will also perform Jay Chattaway's "Superbone Meets the Badman" and Tom Kubis' "On Purple Porpoise Parkway." The Aces, directed by Dr. J.D. Salas, will perform an up tempo version of "The Song Is You" arranged by Mark Taylor, Sammy Nestico's "A Warm Breeze," and John Clayton's "I be serious 'bout dem blues." Scott said she is looking forward to returning to Turner Auditorium for this concert. "We haven't been there in a long time, so the students are excited about performing in that venue," she added. Turner Auditorium is located in the Griffith Fine Arts Building on the SFA campus.